Freddie Gray: Police van passenger says he was trying to hurt himself, according to the Washington Post. 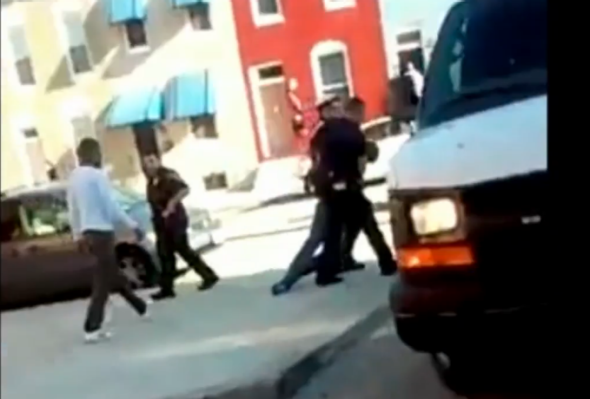 A still from video of Freddie Gray’s arrest by Baltimore Police on April 12th. Much is still unknown about the death of Freddie Gray. The 25-year-old was arrested in Baltimore on April 12 and then taken to the hospital with a severed spinal cord shortly after. Gray died a week after the arrest, on April 19. The timing and cause of the spinal injury that lead to his death are still murky. On Wednesday the Washington Post reported a new, somewhat curious strand of evidence on what might have happened between Gray’s arrest and his arrival at the hospital. One major point of contention is when exactly Gray was injured—during the arrest, or after? The possibility that Gray, or anyone who’s just been chased down and arrested, was “banging against the walls” doesn’t seem far-fetched. If true, it would indicate his spinal cord was not injured during the initial arrest. The idea of Gray intentionally trying to injure himself seems ludicrous at best and, more cynically, self-serving for a police force that just had a young man die under its supervision. Not to mention, as the Post points out, the passenger who provided the account could not see Gray at the time, making it difficult to ascribe intent to whatever he heard going on. Read more of Slate’s coverage of Freddie Gray’s death.